My second post for the a capella series is here – learn all about The New Hampshire Notables, The New Hampshire Gentlemen and Off The Clef! All answers provided by Asa Gomberg. A: As of fall 2015, we have 11 members in the New Hampshire Notables. A: We perform all over the Seacoast and greater Boston area. At the end of this month we will be performing at the Dover breast cancer walk where we sing the National Anthem to kick off the event and then participate in the actual walk afterwards! Q: What has been the best part about being on an a capella group at UNH? A: Personally, the best part about being in an a capella group at UNH would be the sense of belonging to something where everyone joins for the same reason and same common goal. Belonging to a group of women who really loves music and love to sing allows for such a loving and open environment doing something that everyone feels so passionately about. A: I participated in musical theater all throughout high school as well as being a vocalist for one of the bands offered at my school. I also tried to be involved in talent show/open mic night types of events. Having that love for music growing up really pushed me to find something in college related to music. A: I originally thought I wanted to join a co-ed group, thinking that the sound would be more dynamic and there would be more of a variety in songs performed throughout the year. However, after joining an all female group on campus, the thought that we couldn’t do as much as a co-ed group could do drastically changed. During my time in the group, I never felt like were sub par compared to a co-ed group because of our lack o female vocal parts in arrangements. Our sound continues to grow and we continue to create new dynamics within the group. It’s awesome performing and working with a group of motivated women who love to sing an are always striving for greatness in every aspect of their life, especially musically. Q: As a group what would you say your favorite song to sing is? A: We always enjoy performing Stompa by Serena Ryder. One of our music directors, Danielle Lewis, SLAYS at singing this song and brings so much emotion and vocal power during the piece. We all get super into it and speaking for myself and most likely the rest of the group, we all get chills during this song! A: Thank you for including the New Hampshire Notables! All answers provided by Wiley Little. A: We are 14 members strong! A: We perform at all sorts of different gigs ranging from local elementary, middle, and high schools to private companies, weddings, and other special events. A: I think the best part about being in an a capella group on campus has to be the creative outlet that it gives its members and the friendships that it builds. It’s really nice to break away from the grind of engineering and schoolwork to sing and be with a great group of guys. A: In high school I was also in an all male a capella group called the “Soar Throats” and the Gents really gave off a similar vibe and I liked that. Q: What made you want to join an all male group? A: I wanted to join an all male a capella group because of past experience and because I honestly think that the tone that a group like this gets is really unique, interesting, and nice. Not to mention the fact that I couldn’t join an all female group – so that option was out. A: I would say our favorite songs are the mash-up of Beyoncé’s “Xo” and Arcade Fire’s “Wake Up” (we made a YouTube video, check it out! ), “Loch Lomond”, “Want you Back by the Jackson 5, “Danny Boy”, and of course our staple, “Good ‘Ol A Capella”. We are always adding more songs that we love though. A: I just want to thank you for taking the time to found out more about the Gents and also would like to thank the UNH community at large. You all are great! All answers provided by Kacie McFadden. A: Over the years, Off The Clef has done some GREAT off-campus gigs. We have visited some of our members’ high schools and performed for their students and held workshops with them. We also have been adding more and more charity gigs to our repertoire yearly. These are some of our favorite gigs. For example, we performed at Sea Festival of Trees last November. This event showcases beautifully decorated Christmas trees to be raffled off, and all proceeds go to a number of charities. We also recently signed a private-party Off The Clef performance to be an auction item in an online auction for the Arts in Reach program, devoted to providing art and music programs to teens. A new addition to our yearly performances is the annual Faneuil Hall A Cappella Competition. We compete alongside 30+ groups from all over New England and receive feedback from judges. It’s a great way for us to hear professional feedback about our repertoire. While we love performing for the UNH community, we love reaching out off-campus too! A: The best part about being in Off The Clef is finding a family away from your own family. We are fortunate enough to all be incredibly close friends, so close that we sometimes act like siblings. Speaking from personal experience, joining the a cappella community at UNH is like finding immediate friends. Along with making music, we also make countless memories with each other. A: The background experience of our group varies greatly. Some individuals joined because they were in their high school choirs or a cappella groups and wanted to continue making music in college. Some join for the pure love of singing, even if they don’t have prior experience singing in groups. We have all types of majors, from Mechanical Engineering, to Spanish, to Music Education. While we all come from different backgrounds, one thing we all have in common is a love for music and a passion for making it. Q: What made you want to join a co-ed group? A: The appeal of a co-ed group is the full sound. With both female and male voices, the range of our arrangements provides great opportunity for us to showcase talent. Q: As a group, what would you say your favorite song to sign is? A: Off The Clef’s favorite song is definitely Ain’t No Rest For The Wicked by Cage The Elephant. This is a song we have been working on for a while, and we have grown comfortable enough with it to really work it to perfection. We have added a touch of choreography and we are able to have a crazy amount of fun with this song. Our soloist, Bobby Evans, really works the crowd. We always have a wonderful audience reaction when we finish this song! 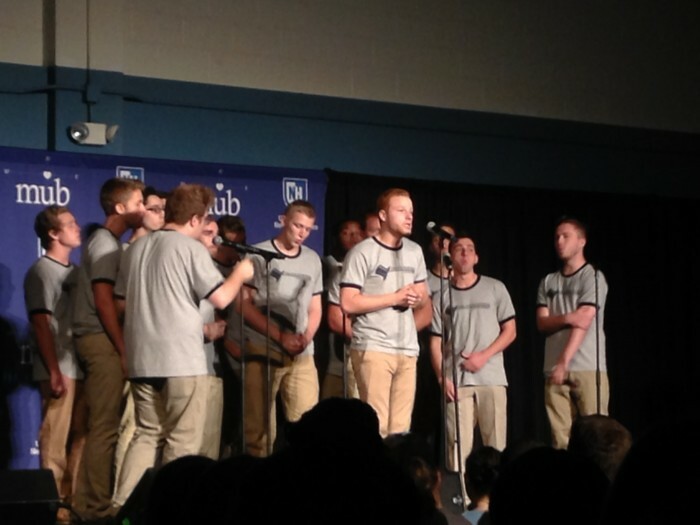 Thank you to all the a capella groups at UNH for all the entertainment and wonderful music you provide to the community. We look forward to keep listening – keep up the good work! 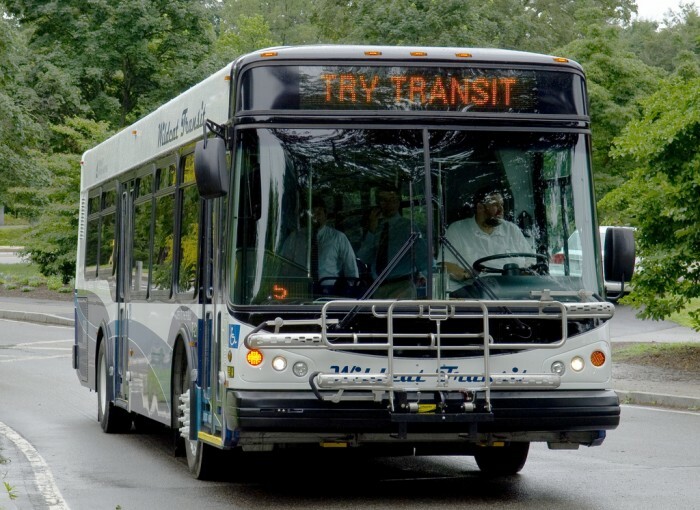 Wildcat Transit is a Wonderful Thing!